AV Niche manufacture and sell PACE compliant interview recording equipment as well as related accessories and services. The fully digital AIR audio interview recorders are designed for evidential suspect interviews or Interviews Under Caution. They can be configured for up to 8 hours of stereo recording time with 2, 3 or 4 digitally signed CD copies supplied at the end of your interview. AIR recorders incorporate a number of future proof options including network recording as standard. The AVN range of digital video interview recorders feature robust design and construction, and intuitive "easy to use" operation. They have an integral message display with user prompts, audible & visible alarms and picture in picture (PIP) placement options. 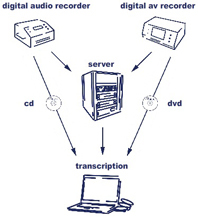 Various configurations are provided for camera and microphone input, and the number of DVD copies required. Static and portable versions are available. Our range of accessories include everything from microphones to carrying bags. And our services cater for all your audio visual needs, from media file recovery to sound and video recording.